An in-house legal career offers some enticing advantages over the traditional law firm track. Compared to their counterparts at law firms, in-house lawyers generally enjoy an improved work-life balance, have more leadership opportunities, aren’t under pressure to bring in new clients, and are free from the billable hour (and all of the paperwork that goes with it). But even with these perks, there are many challenges faced by women in in-house legal departments. If you’re considering taking an in-house legal position, here’s what you can do to confront these challenges head-on. Depending on the size of the company you work for and the industry you’re in, you may have very few women peers. At many companies, the majority of c-level executives and other managers are men. If you join a small or mid-sized company, or work in the tech industry, the lack of women in your ranks may be especially pronounced. Before you accept an in-house position, don’t be afraid to ask about the number of women at the company who are in leadership roles. Some of this information may be publicly available on the company’s website. If you are interviewed by a woman, ask about how the company supports women. If there aren’t any women interviewing you, consider this to be a red flag. Don’t be afraid to ask about the company’s plans to increase diversity and promote women to management positions. The lack of women in legal roles and other leadership positions at many companies underscores the importance as an in-house lawyer to have strong female mentors in your network. You should seek and nurture relationships with other women lawyers who can provide advice and an outside perspective when you need it most. One of the biggest challenges when considering a new in-house role is determining what an appropriate salary range is for your position and responsibilities. In-house salaries can vary widely based on a number of factors, including work history and years of experience, the geographic area where the company’s headquarters are located, the maturity of the company (i.e., start-up vs. established company), the number of employees the company has, the size of the legal department in which you’ll work, and the profitability of the company. If you’re moving in-house from a law firm, you may be taking a significant pay cut to work in-house. If you’re going in-house straight from law school, you may be earning much less than your peers at law firms. When it comes to negotiating an in-house salary, the wage gap between men and women in the legal profession only makes things more difficult. A recent study by the American Bar Association suggests that women lawyers make less than 87% of what their male counterparts make. 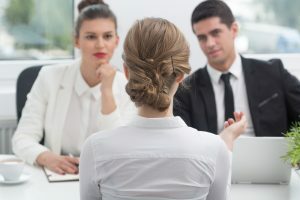 Before you begin negotiating an in-house salary, talk to women and men who are in in-house roles about how much you should expect to be paid — you may be very surprised by what you learn. Familiarize yourself with whether your state has passed laws about an employer asking for your salary history during the interview process. You should review annual salary reports released by legal publications and recruiting services, taking into account factors like region and company size. If you’re being offered stock options or bonus consideration along with base salary, review the stock plan and bonus criteria very carefully. Negotiating a fair starting salary at a company is critical to your long-term financial success. In an effort to cut costs and flatten organizational structures, many companies have reduced or eliminated administrative staff. This can leave high-level managers left to book their own travel, calendar their own meetings, take notes at these meetings, and complete other administrative tasks like filing expense reports. If you’re one of the few women on an executive team, these types of tasks might start to creep into your workload. If you feel like you’re being inappropriately tasked with these types of low-level administrative responsibilities, push back. You were hired to provide legal advice and probably have a full workload as it is. If your colleagues can’t manage their own administrative tasks, insist that an executive assistant or office manager be hired right away (even if only in a part-time capacity). Depending on the nature of your in-house role and how many attorneys you work with in your department, you may field requests from multiple teams within your company and need to juggle many time-sensitive projects at once. Often, business people don’t understand how much time a “simple request” can take and lose patience with you when legal review takes longer than expected. In addition, in-house lawyers are under more pressure than ever before to reduce outside counsel fees and keep costs down. These pressures are part of life as an in-house lawyer, but they can be especially difficult for women to manage in light of the invisible barriers they face when trying to advance their careers and on top of their responsibilities outside of the office. You need to set appropriate boundaries with the various teams at your company and manage their expectations about turnaround times. You should also dedicate time for self-care throughout the week and treat it as seriously as you would an important meeting. If you don’t, you’ll be left feeling burned out. There are many women who have enjoyed satisfying careers as in-house attorneys. In the right work environment and with a robust support network, you can thrive as an in-house lawyer. It’s all about finding the right company and making sure you have a go-to team of women lawyers who will support you as you advance your career.